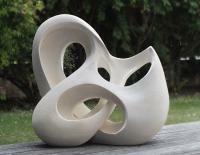 The satisfying results from sculpting in stone have had positive effects. 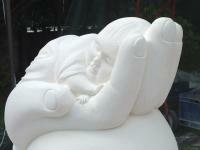 For many stone carving and sculpture are therapeutic activities. People trying carving for the first time find it enjoyable and calming, A small sculpture such as a Koru can take about 30 minutes to complete so the sense of achievement is immediate. Some of the satisfying results from the advanced students is that they gain enough confidence to work with their own ideas and create pieces that relates to their own individual personality. Usually their sculpture reflects what ever is going on in their life at that time. Maybe they are working on a special piece for a friend's birthday or it is just an unique piece for themselves. It is good that people take great pride in creating something themselves and then carry this over to their home environment, a place where they can relax and find peace. Some people have used stone sculpture to connect to their spiritually or to play homage to ones who have passed on. The sculpting process becomes a way to work through their grief. So it becomes a really individual process. Sometimes it is the unknown that has an effect, like the person wasn't expecting it to become therapeutic. They find themselves thinking about their sculpture and they look forward to attending class to continue working on it. 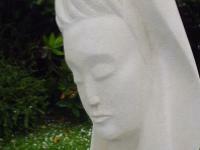 There are many personal stories about the satisfying results of stone carving and sculpture. Read Joy's story of how sculpting in stone has been therapeutic in bringing out her creative side. My journey began when I saw a sea bird in stone. My mother had passed away and I bought it in memory of her. My hands felt the smooth stone, I felt the curve, the shape and I just knew that that was what I would like to recreate. Night school commitment began. I couldn't draw so I would have to rely on my hands to feel if it was right. No problem, the example of the item was there, with clear instructions and we were introduced to tools and how to use them. The shape was measured and the sawing began. I couldn't cut bread straight but here I was with the saw gliding through the stone, no pressure but a fluid movement and though glowing with effort, I relaxed and went with the flow. The chiseling began, tentative at first, and then I was coaxed to command the stone and make it do what I wanted. My confidence grew as techniques unfolded for how we wanted the stone to go. As I chiseled and exposed what I wanted to happen, I also knew what actions I had to take with responsibilities that I had and where my life should go. Then came the use of the 'cheese grater'. I rasped the shape smooth, ready for the sandpapering. Now, my hands with fluid movements, coaxed the stone to be how it should feel to touch. Confidence grew as I tried to make my own items and shapes and experimented with what if? The advanced class led to another stone albatross, a modern impression of two figures, an abstract piece called 'the bumpy road of life' showing hope and strength with my hands guiding me to how it should look and feel. My last piece was called 'Devotion' made from recycled stone in memory of my parents. I realized that I had worked through my emotions of sadness through working with the stone. I realised I had made a new ending, I had dared to dream and had linked into my creative side Being in control of the stone and its direction, was now reflected in my own life. 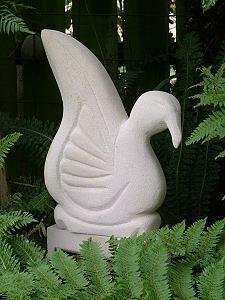 For me stone carving had been a therapeutic and holistic experience with satisfying results.I dare you to dream.